Among the many opportunities alumni have to reconnect and give back to YU, one of the most significant ways they can impact the student experience is by offering assistance with career development. Many alumni participate in panels and professional events for undergraduate students to highlight different career paths, offer firsthand information, and allow for networking with like-minded peers. The Career Development Center (CDC) uses the alumni office’s Ambassador Network and their InfoLink site to maintain a list of alumni volunteers and the professional fields in which they work and then periodically invites them to speak to students and share their experiences on the job and what helped prepare them while they were still in college. 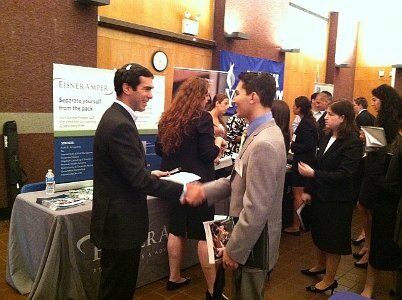 Another valuable way alumni can assist is by providing students with internship opportunities at their companies. If your company can offer work experiences for YU students or you know someone who can, email cdc@yu.edu. This past semester, YU students were invited to numerous career panels on fields such as finance, and working on Wall Street; marketing; journalism; technology; women in medicine; and fashion. One of the most successful events was “Being Orthodox in an Unorthodox World,” which took place on the Wilf Campus in September. Alumni employed at prestigious law firms, investment banks, and accounting firms discussed the challenges and opportunities that arise when working in a non-Jewish environment. Rabbi Yona Reiss, the Max and Marion Grill Dean of RIETS, shared his experiences working at an international Wall Street law firm prior to his current position. Rabbi Reiss told students, “You have a right and a responsibility to be different.” After Rabbi Reiss spoke, students dispersed into four groups with a male and female professional speaking to each group. Issues covered included head-covering, non-kosher restaurant etiquette, and the need to leave work early for Shabbat. If you are interested in being interviewed about your career to help aspiring students volunteer at Candidcareers.com, a new resource for YU undergraduate students that is currently seeking graduates to speak about their occupations. They will film a 5-minute interview about your work, tips you have for students considering the field, and aspects of the job you find most rewarding. If you will be in the NY-area and wish to be interviewed, please contact Laurie Davis at lbdavis@yu.edu.